A serious injury can place a significant burden on the victim and his or her loved ones. This can include medical bills that are difficult to pay off if you are unable to work and earn an income. However, if your injury was caused by another’s negligence, you may be able to file a personal injury lawsuit against the at-fault party that could enable you to recover compensation for your injury and losses. 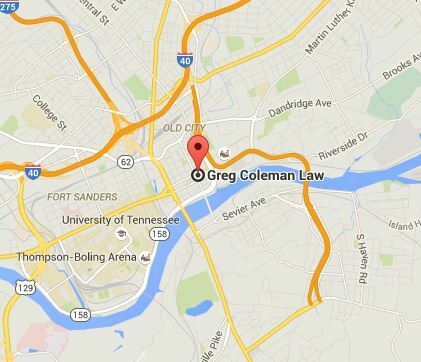 Greg Coleman Law’s dedicated personal injury attorneys in Knoxville have provided this list of questions commonly asked about personal injury lawsuits. If you have any questions or believe you have a case that entitles you to compensation, do not hesitate to contact us for a free, no obligation consultation. In order to file a personal injury lawsuit, you must be able to prove the at-fault party was negligent in causing you harm. We will review your claim during a free, no obligation initial consultation to determine if all four of these factors are present. If they are, we can proceed to exploring the option of whether bringing a personal injury lawsuit is in your best interest. An experienced attorney who understands the complexities of personal injury law can be a beneficial asset to you during the process of a lawsuit. A skilled attorney will be able to collect evidence regarding the accident and your injuries, such as police reports and medical documents, in order to build a case that supports your claim. Our experienced attorneys have represented numerous personal injury victims and will work to help you recover the maximum compensation you deserve. We will protect the validity of your claim from outside influences, such as insurance companies or attorneys representing the at-fault party that might attempt to reduce your claim’s value or have it denied altogether. The circumstances surrounding each personal injury case is different, which means the amount of compensation you may be entitled is unique to your situation. We will thoroughly investigate your claim to determine the severity of your injury and how it has affected your life. This information will then be used to assess your claim and determine the compensation you deserve. If your injury enables you to take legal action against the party responsible for causing it, you must do so quickly. Under Tenn. Code § 28-3-104, Tennessee has a one-year statute of limitations to pursue a personal injury claim. It is imperative that you follow this strict legal timeframe for filing a personal injury claim against the at-fault party. If you fail to do so, you will lose the opportunity to recover compensation. Our attorneys are well aware of deadlines imposed by Tennessee for personal injury claims, and will work ensure your claim is properly filed with the court within the statute of limitations. However, you must contact us as soon as possible, to ensure there is time to file a case. Do I Still Have a Case if I am Partially at Fault for My Injury? Even if you are partially responsible for causing your injury, you may still be able to bring a clam against the at-fault party. Tennessee uses the concept of comparative negligence to determine liability in a personal injury claim. Under this rules, the court will reduce the compensation you are able to recover by your percentage of fault in causing the accident. However, if the court finds that you are more than 50 percent responsible for causing your injury, you will lose the right to recover compensation. At Greg Coleman Law, we understand that personal injury victims and their loved ones often face difficult financial and personal burdens. For this reason, we provide all of our legal services on a contingency fee basis. This means our attorneys will represent your claim for no upfront costs. We will only charge for our services if we help you recover compensation. Personal injury victims have the right to file a claim and pursue additional damages against the person or entity who caused their pain and suffering. If you or someone you love has been injured because of another’s negligence, do not hesitate to contact our accomplished personal injury attorneys for a free, no obligation consultation. We will thoroughly review your claim to determine if you have a case that entitles compensation.